The Teardrop trailer by Colorado Teardrops. "What is that?" This question was stated by the gruff leather-clad biker as he strode over from his American iron, which was parked nearby still emitting soft pops and pings as the metal of the engine cooled. I found it interesting that the little wheeled device that was strapped to the back of my ancient rust covered Suburban had garnered the attention of this road warrior. What he was looking at was indeed interesting. A rebirth of a relic from the 1930s, with a modern twist and construction. It was a Teardrop travel trailer. If you are curious about the historical origins of the Teardrop, I would encourage you to review this article from the December 1936 issues of Popular Mechanics: Teardrop Plans 1936 Popular Mechanics. The Teardrop I was towing was made by Colorado Teardrops, which is based out of Boulder, Colorado. I had been approach by the company seeking assistance with getting the word out about their product to the hunting community. After looking through their website, I was intrigued by this very unique aluminum-clad trailer, and offered to review it from a hunter's perspective. Plans were made and several weeks later I found myself in the heart of Boulder, retrieving the test trailer for a few days of coyote hunting in the beautiful Colorado mountains. Dean shows the Teardrop to the Colorado Hunter. "Our goal is to be in Camping World!" This was one of the first statements Dean Wiltshire of Colorado Teardrops said to me. Dean was genuine, sincere, driven, and honest. I liked him instantly. When I arrived, I had found Dean working on the very trailer that was to accompany me. It was 8.5 feet and 900 pounds of quaintness. There were two doors to enter into the 6 foot sleeping area which sported several cubby-style shelves. The real magic was found at the end of the trailer. A sweeping rear door hinged up and away to reveal the outdoor galley of the camper. We will use a much more outdoorsman-friendly term and call the well designed galley a "work space" for now. The work space was well organized and had built-in shelves for the ice chest, cooking stove, water container, and even came stocked with fire wood. The upper portion had ample room from storage of cooking utensils and food. I later found that the shelves fit canned goods nicely and held them there during transport. If you are interested in the exact specifications on the Base Camp model I was reviewing, I would invite you to peruse the Colorado Teardrops' brochure. Colorado Teardrops sells and rents these trailers if you are seeking one of your own either temporarily or on a more permanent basis. The work space, aka Galley, of the camper. 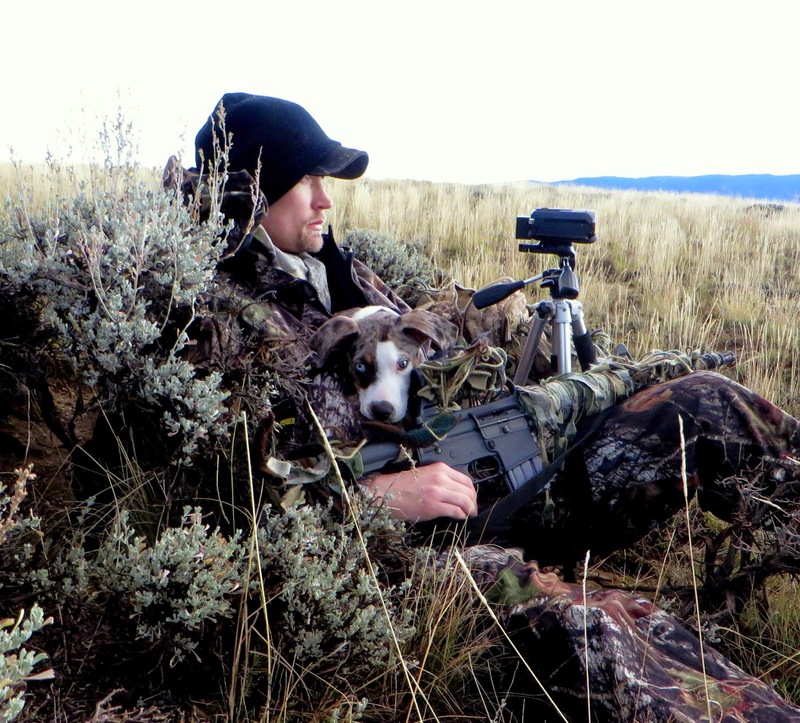 My hunting destination was several hundred miles and one 10,000 foot mountain pass away. I was excited for this adventure and headed out after a brief stop to load gear and supplies. I had a companion on this trip, and shortly after we departed, inevitably an excellent conversation was struck up. It was not until several hours later I remembered I had a trailer behind me, it towed that well. The trailer was very light and tracked well behind my Suburban. I have no doubt that a small vehicle would have no difficulty towing this trailer. The weather for our trip had conspired against us and we were forced to drive through several rainstorms, after which we checked and could not find a single leak inside the sleeping portion of the trailer. Sleeping quarters, complete with an upper vent. As a result of the rain, I encountered the muddy roads that I both feared and partly hoped for to test the trailer out on. Trailers and mud are generally a bad concoction at best. Too much weight on the rear of the vehicle can bog it down and make it very difficult to proceed. I was pleasantly surprised to discover the light weight trailer had very little effect on the four wheel drive capability of my aging beast. Despite several close calls, we never got the truck or trailer stuck in the slippery Colorado mud. Dean had told me to return the trailer without washing it and I felt very guilty with the amount of earthen debris it had collected. Camping out of the trailer was great. Everything worked as it was designed. The lack of a battery or on-board electricity was a small inconvenience but easily overcome. The bed was queen sized and totaled 6 feet in length. This was a boon to my 6' 2" frame and I had to lay in the bed at an angle to fit. Colorado Teardrops has already addressed these two issues with a new trailer that has a 6' 5" foot bed and has plans to incorporate a DC battery and solar panel charger into upcoming models. Overall the camper by Colorado Teardrops is a great trailer. I would highly recommend it to anyone looking for a unique and light weight travel trailer. This trailer eliminates the need for a large truck to tow it and would be a welcome edition on any hunting trip. I envision this as the perfect solution to the hunter with an SUV, smaller truck, or even a car who is tired of damp and often leaking tents. Furthermore, if you like being different or traveling your own path, it is easy to do with a Teardrop. You can not stop at a gas station or travel the highways without admiring stares or questions. Oh, and our gruff biker friend was so enamored with the Teardrop that not only did I have to open all the doors and hatches to show him, but he brought his fellow biker comrades over to see the trailer as well. During my short adventure I could not resist taking many photographs and video of the little trailer. I hope you enjoy this video review I made of the camper. Closing thoughts this time are on ambition. Dean struck me as a motivated fellow, and as hunters we are ambitious folks. Why else would be leave the comfort of our homes to go out in the snow, rain, mud, and cold. Braving whatever weather conditions our chosen landscape throws at us to test our mettle. If you have a Teardrop with you, then at least at the end of the day you will have a warm, dry place to recharge for the next morning's adventure. The parting quote belongs to Bill Bradley: "Ambition is the path to success. Persistence is the vehicle you arrive in." This couldn't be a hunting blog without at least one hunting picture. Here is Bo and I on a call stand. There were lots of coyotes around us and several sighted, but that story is for another time. I also could not resist my eyes to stumble on your photographs and video of this little trailer. Definitely will try this Car Trailers to go on a vacation.